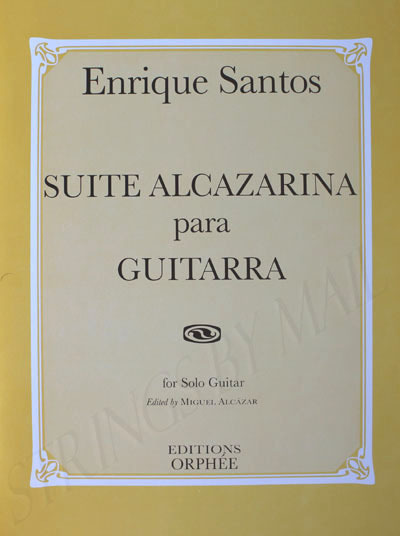 Enrique Santos Suite Alcazarina for Guitar Edited by Miguel Alcazar. Enrique Santos studied composition with R. Halffter. His overture a Siman Bolivara was chosen for the 1984 International Music Festival in Moscow (USSR). In the same year, his first guitar concerto was premiered in Pittsburgh (USA) by Miguel Alcazar and the Pittsburgh Wind Symphony Orchestra. He became interested in writing for the guitar through his friendship with the guitarist and composer Miguel Alcazar, a friendship which produced, so far, three suites and two concerti for the instrument. 10 pp.